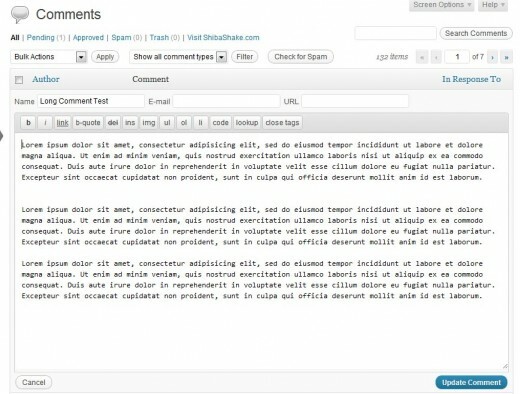 Here, we consider how to expand the quick edit menu on our WordPress comments list screen. This earlier tutorial deals with how to expand the edit single comment screen. 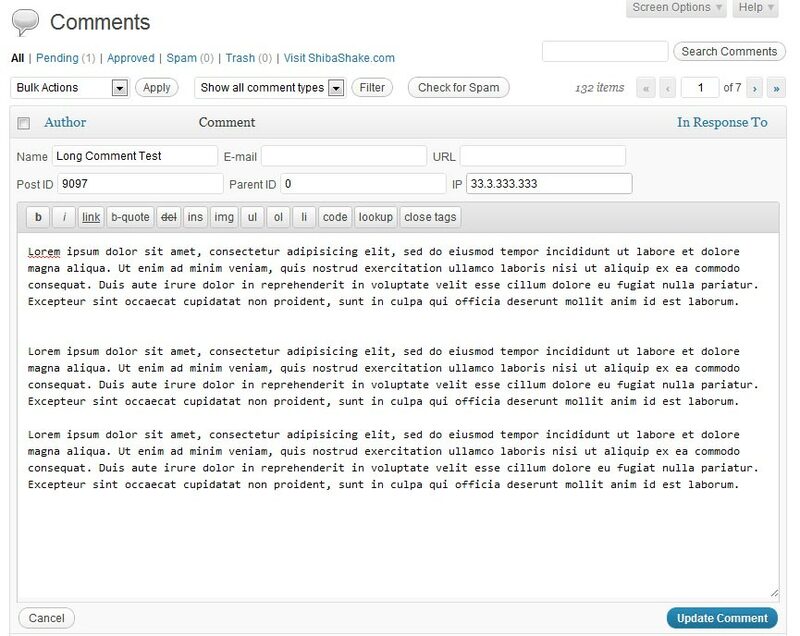 We can add elements into the comments quick edit menu by hooking into the wp_comment_reply filter. This filter allows us to replace the existing menu with our own creation. However, since we only want to insert a few new elements, and keep the rest of the interface intact, we start by copying over the HTML code from the current menu. The HTML code can be found in the wp-admin/includes/template.php file, in the wp_comment_reply function. After we reproduce the default menu, then we can add in or change whatever elements that we want. Lines 60-79 are our added comment fields. All the rest is from the existing quick edit menu. Below is our expanded menu, in particular, Post ID, Parent ID, and IP input boxes have been added. Include the relevant data in each row of the comments list table. We can add new data into the comments list by hooking into the comment_text filter. In this case, we are not using the filter to change the comment text, but rather to generate new data at the right place. Line 5 – Set the visibility of our data to hidden so that it does not clutter up the commments list table. Lines 6-8 – Add the comment-post-id, comment-parent, and comment-author-ip to each comment row in the table. This corresponds to our three new quick edit menu fields. Line 8 – Retrieve the quick edit menu div (#editRow). Line 9 – Retrieve the current row being edited (#rowData). Note that inline-xtra-‘+id should correspond to the div name specified in our my_menu_data function. Lines 10-12 – Extract values from the current row being edited (#rowData) and insert it into our quick edit menu (#editRow). commentReply.close() ensures that a previously opened quick edit menu is properly closed. To save the values of our new fields, we hook into the comment_save_pre filter, just as we did when adding a metabox to the Edit Comment screen. Since we are only expanding the comments Quick Edit menu, we want to limit the scope of our code to only this screen. It is generally a good idea to tighten the scope of our functions so that there is less risk of unintended side effects, or conflicts with other plugins. Line 5 – Check that we are on the comments list screen (edit-comments). Lines 6-9 – Only include the necessary quick edit menu filters and actions when we are on the comments list screen. This will add the expanded functionality to the edit-comments as well as edit post screens. As of WordPress 3.5, the current_screen filter no longer gets called when making asynchronous (e.g. AJAX) calls to the server. Therefore, we also need to add our quick edit actions and filters to the appropriate ajax calls. Enjoy your new expanded quick edit menu. How to add new fields into the quick edit menu for posts, pages, and custom post types. 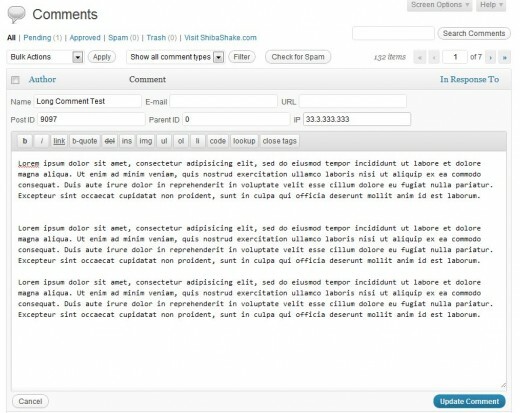 How to expand the Edit Comments screen with a new custom metabox. How to add new input fields to our Edit Category administration menu. We can then link it to new category meta-data or to the WordPress custom taxonomy system. I was looking for a tut just like this – you always seem to have what I’m looking for 🙂 What if I want to save a user-defined field? Would that be as easy as including a field for it with my custom ID and then saving it? For instance, instead of comment-post-id, could I use my-custom-comment-id? Sounds like it should work, as long as the value(s) are properly saved and retrieved to populate the new fields. Google Authorship - Good or Bad for Search Traffic? - Thanks for this tutorial. Does someone knows if this still work with wordpress 5.03 and 5.1. - How do you style the "X" that shows up when you start typing? - Update permalinks. Go to settings > permalink and just save it. - I want to access two different types of taxonomies like city and room, how can I access it via wp permalink? - Thanks for this, took a while for me to find your post but it's the only answer online!